Cocaine: Are the number of addicts increasing? The Guardian DataBlog is a great resource if you want to take random data sets and practice your visualization skills. One of the great aspects of this blog is that they provide all of the data; all you need to do is download them and start playing. There was a blog post on December 3rd with the subtitle "Latest figures show more and more young people seeking treatment for cocaine addiction." 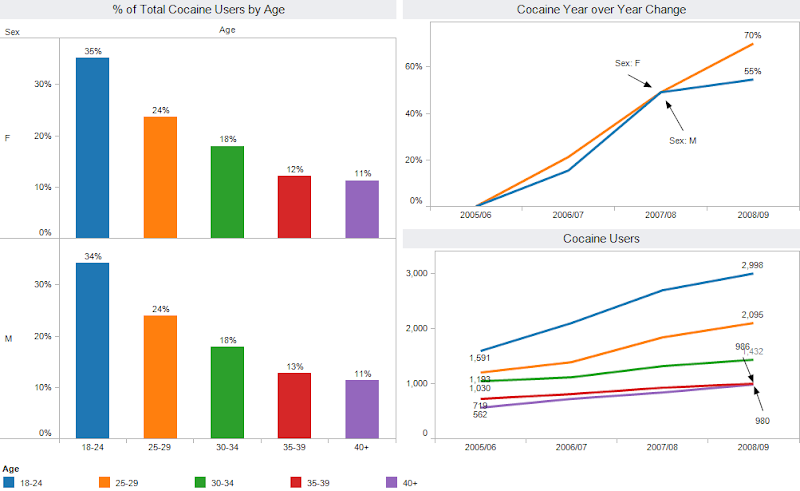 The report in this post was concise and to the point: the number of people between the ages of 18-24 seeking treatment for cocaine use has skyrocketed between 2005 and 2009. I wanted to take their text-based summary and create visualizations (which is what they challenge their readers to do). First, I wanted to understand the amount of drug use for all drugs. 70% of the addicts are being treated for opiates or an opiates/crack cocktail. This should obviously be the focal point for reducing addiction rates. It looks like there could have been some type of drug prevention or treatment program launched in 2006-2007. I would have to do some deeper research to find out, but this quick visualization leads you in that direction, which is exactly what rapid fire analysis is all about. 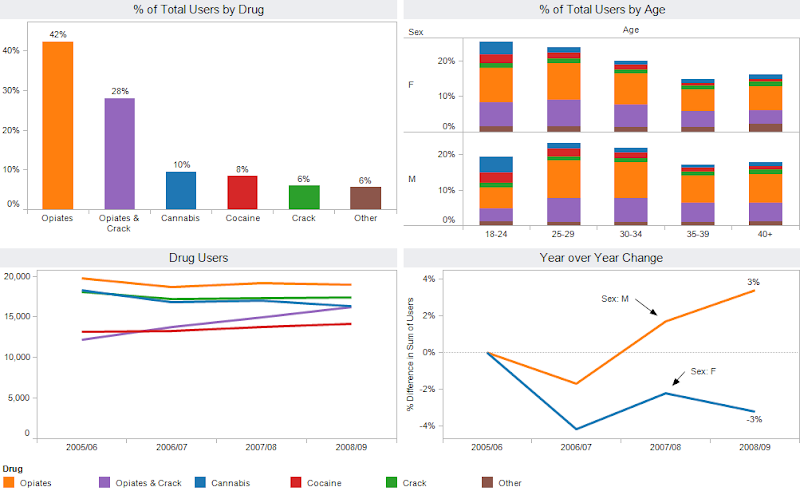 Female drug use is at its highest between the ages of 18-24, while men seek treatment between the ages of 25-29. In the visualization for cocaine use only, I wanted to duplicate exactly what the blog post stated. A total of 1,591 people in England aged 18-24 began receiving treatment for dependence for cocaine in 2005-06. That number has soared to 2,998 in 2008-09, a jump of 88%. The number of women in the 18-24 age group rose 80% (from 329 to 592) over the four years, while the number of men increased by 91% (from 1,262 to 2,406). Among under-35s, the number of women starting treatment has gone up 60% (from 790 to 1,261), while for men it jumped 75% (from 3,024 to 5,263). I believe this visualization captures all of these effectively in one view. I made both of these interactive use Tableau. You can download the packaged workbook here. If you have Tableau Desktop, then you can created your own views and I'd love for you to share them. If not, you can use the free Tableau Reader and interact with the data by simply clicking on the points of interest. Once you click, all of the other views will automatically refresh. I agree with your comments regarding The Guardian. They are really doing a great job of sharing the source data. Wouldn't it be even better if they were using a tool like Tableau and would provide the data with with granular details to subscribers? Regarding the drug problem. I wonder if drugs were legal would the problem get better or worse. Would redirecting funds from interdiction to treatment be a more effective way to reduce demand? Legality would reduce the margins in illegal drug traffic. What would be the effect on our legal system? I have always wondered what legalization would do as well. It seems at times that people may do it just because it's illegal. There would be a huge spike in use initially, but I bet in the long run addiction rates would go down. Of course this is a political time bomb, so it'll never ever get discussed. I sure wish Tableau would connect to Google Spreadsheets. Have you heard anything? ?